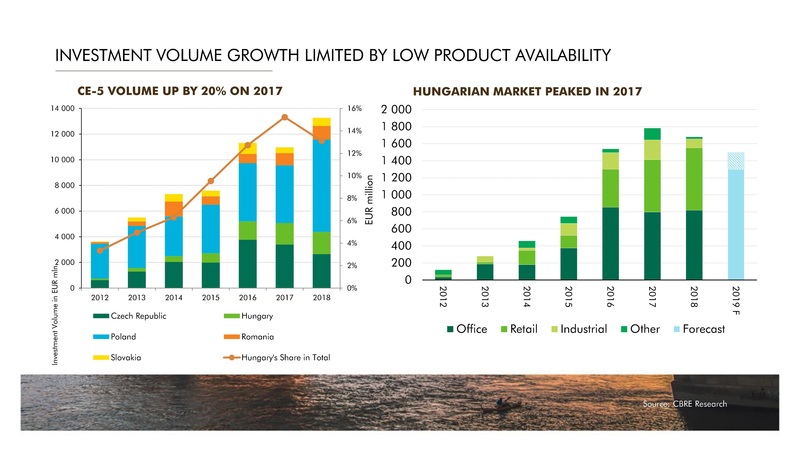 Hungary’s investment market peaked in 2017 but a solid €1.8 billion was transacted in 2018 with local investors closing 65% of purchases on the buyer side. Property Forum summarised some of the key market trends presented at CBRE’s yearly Re-View business breakfast. Economic growth in Central Europe remains twice as high as in the core Eurozone. Hungary’s GDP growth peaked in 2018. There is a slow deceleration ahead. Hungary currently has the strongest economic sentiment in the EU. Construction sentiment is also one of the strongest in the EU. Hungary’s investment market peaked in 2017 but a solid €1.8 billion was transacted in 2018. In terms of asset classes, industrial will become more popular in 2019. There is a weight of money looking at logistics, but there is not much to sell. Hotels are being overlooked while ‘others’ such as residential will come up even though the products are not really ready yet. Many large retail assets traded in the recent period, so retail’s share will be lower in 2019. The Czech investment market is slowing down due to lack of stock which might be an indicator for the future of the Hungarian market. Hungarian investors made 65% of purchases in 2018. Based on last year’s figures, US investors are leaving, German and Austrian investors are coming back and cross-CEE investments are increasing. Most of the yield compression has already materialized. As of Q4 2018, offices trade at 5.75%, retail assets trade at 5.50% and industrial yields stand at 7.50%. Banks are willing to compete for the right investment product, but for development loans, pre-leases are still a must. Construction costs keep increasing and in many cases, the rental increase doesn't really make up for the higher costs. Some projects are being put on hold.